Are You Eager To Take The Warriors Leap Of Faith? Felix Baumgartner’s historic Mach 1+, 119,846’ free fall to earth on Oct. 14, 2012. By virtue of being a business owner, you have chosen to live the “warrior’s life.” Welcome to the club. We warriors can gain courage by gleaning lessons from the best practices of others who have been successful in their fields. Does this sound too daunting? It does because most of us allow circumstances, fears and doubts distract us from focusing on the prize. But we don’t have to be mired in the morass of these fears and doubts! Let’s gain courage to go after the prize by learning from the story of another warrior--Austrian adventurer Felix Baumgartner. On Oct. 14, 2012, Baumgartner set several world records as he stepped out of a capsule that had ascended to 128,100 feet, suspended by helium balloons. While we might think of his success as his accomplishments that day, in fact he succeeded on the day he chose to start down the path. 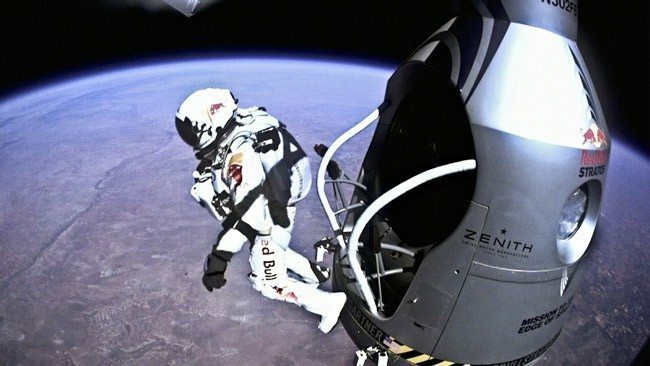 The David Clark Company modified a high-altitude pressurized suit to protect Baumgartner’s body as he crossed the 62,000’ Armstrong line at which his blood would literally boil. With the support of a high altitude flight team, Baumgartner trained to overcome the claustrophobia of being in a pressure suit head to toe for up to five hours. A former BASE jumper and helicopter pilot, he learned to maneuver his suit while hurtling at supersonic speeds. Exiting his capsule is but an echo of that long-ago decision. If like Baumgartner you want to achieve your prize five years from today, what will your first step be? I suggest it begins with the decision to get there! Follow that up with surrounding yourself with the assistance of others who will help you with the right tools and the support necessary to accomplish your success. And just as importantly, train yourself to distinguish between what you can control and what you cannot control, then prepare yourself to take a leap of faith. Write to let us know what that first step in journey is for you. The post Are You Eager To Take The Warrior’s Leap Of Faith? was first published on American Business Advisors Inc.
via Blogger Are You Eager To Take The Warrior’s Leap Of Faith?